It seems as though this comes up in nearly every film review I write, but I absolutely love zombie films.Â I’m not entirely sure why, but I just do.Â Maybe I like to see people being killed not because of race or creed, but simply because they are trying to eat someone else’s brains.Â It’s a welcome change in George Bush’s America.Â Now here’s another chance to see a more sensibly divided realm of life and death. Starting this May 20th, now available on DVD from Artfire Films and Dimension Extreme Studios comes the latest vision of the zombie apocalypse from the greatest mind in zombie films.Â George A. Romero’s Diary Of The Dead is ready for you to bring home and scare yourself witless with.Â This wonderful reimagining of the beginning of the zombie invasion will make a good addition to your movie library. This is the fifth and final film in George A. Romero’s completely legendary Living Dead series.Â It started with Night Of The Living Dead, Dawn Of The Dead, Day Of The Dead, and, prior to the release of Diary, ended with Land Of The Dead.Â It took Romero 40 years to finish the series.Â Remakes of the first three were released before the fifth movie was done.Â In this film, a group of students are shooting a horror film when they begin to hear reports of people rising from the dead.Â From there on out, it follows pretty standard zombie movie stuff.Â They hit some with a car, they underestimate the zombies, they end up in a hospital, some of them turn into zombies, they run into a group of people who are way too prepared for the zombies, they escape in the nick of time and it seems like they get away when, in fact, no one ever really does. The special features included in this DVD are an optional audio commentary from writer/director George A. Romero, Adam Swica and Michael Doherty, a feature-length documentary on the cast, crew, and making of the film, a featurette looking into the inspiration for the film, a visit to the set of the film, outtakes of some of the cameos in the film, five zombie film which won the Myspace movie contest, and character confessionals. I started out liking this movie, then went to not liking it, but I love it now.Â As usual, Romero does a great job with the zombies themselves.Â There is some great gore, a ton of cameos, and some great voices doing the voice overs.Â I won’t spoil the fun, but you’ll certainly notice.Â Romero has always packed lots of messages into his zombie films, and this one is no change.Â We see commentary on race and one of the best send-ups of the meta-narrative I have ever seen.Â Zombies always stand for something and we give them a meaning, we make the movie a commentary.Â Romero has the kids making a movie and putting their own meaning into it and completely ridicules this idea even as he is doing it himself.Â That’s priceless.Â That is Romero and film making at it’s finest. Take a peek at this deadly Diary today! 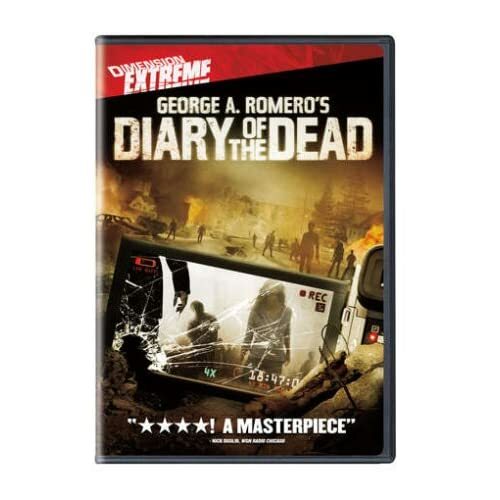 No user commented in " Movie Review: Diary Of The Dead "